May be the headline sounds fishy, but we have got a shocking news for you. For w while, everyone thought that Kodak is completely out of the market after a severe period in which the company faced bankruptcy. But now, looks like the camera maker Kodak is ready to gamble in the market, but this time the product is not a camera, now Kodak is planning to launch Android smartphones. 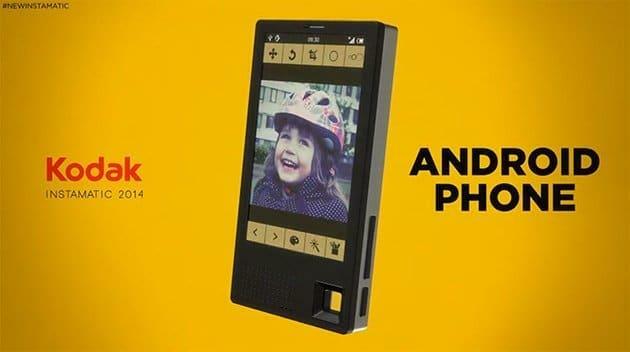 The first smartphone from Kodak will be launched in CES 2015 next month in Las Vegas, while other handsets which include a 4G handset, a tablet and a connected camera, will arrive during the second half of 2015. According to Kodak, their phones will be for those people who like high-end experience, but don’t have problems with complicated gadgets. Kodak has collaborated with British firm Bullit that will make most of the components of the smartphone and they have already promised a great design along with a beautiful UI. Currently, there have been no words spoken about the specifications, but it is pretty sure that the main focus will be on camera, as the smartphone comes from a camera manufacturer. Earlier, companies like Samsung with its Galaxy S4 Zoom and Galaxy K zoom and Panasonic, with their Lumix DMC-CM1 stepped into the smartphone market with some phones.